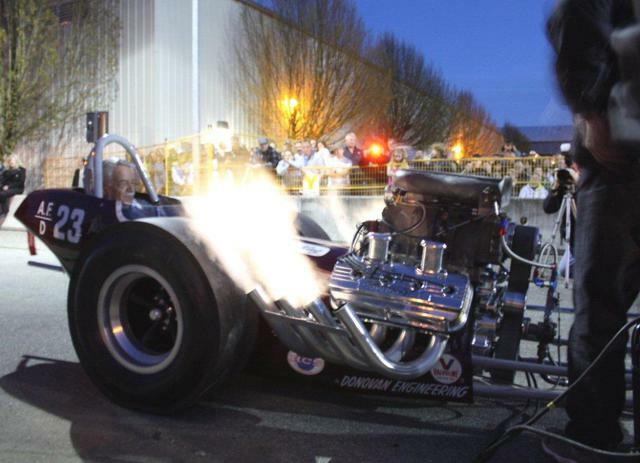 The history of this Original 1963 Top Fuel Dragster will be interesting to old drag race fans. 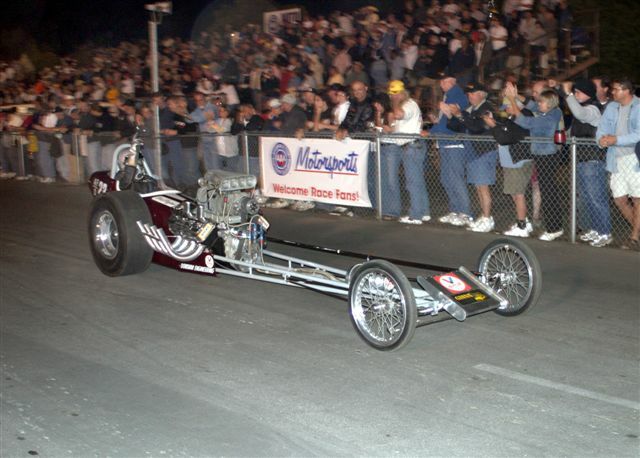 This dragster was originally built by Tommy Ivo for Ed Schutzs from Lompoc California. 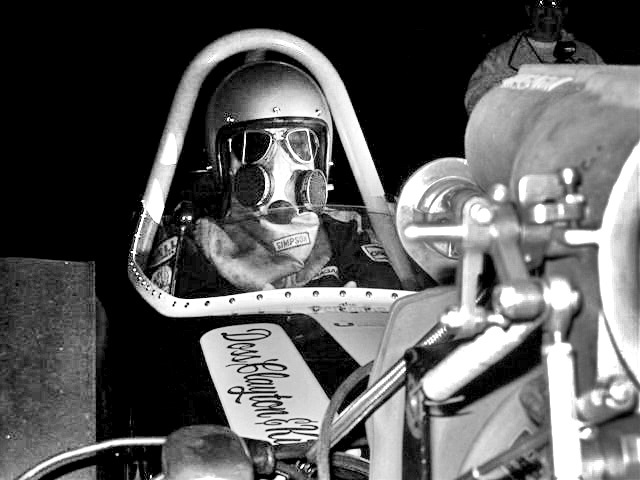 The car was welded together by Ron Pepmuller in 1962, Rod told me at the first CHRR that this car was the one he learned to weld on. He said he would arc weld for a while then gas weld for a while. The tail was hand built from aluminum by Bob Sorrell from Harbor City. I don't think the car was ever Heli Arc welded until Dave Jeffers welded on the frame in 1963. A story on this later. Ed had a Muffler shop by the name of Eds Muffler. 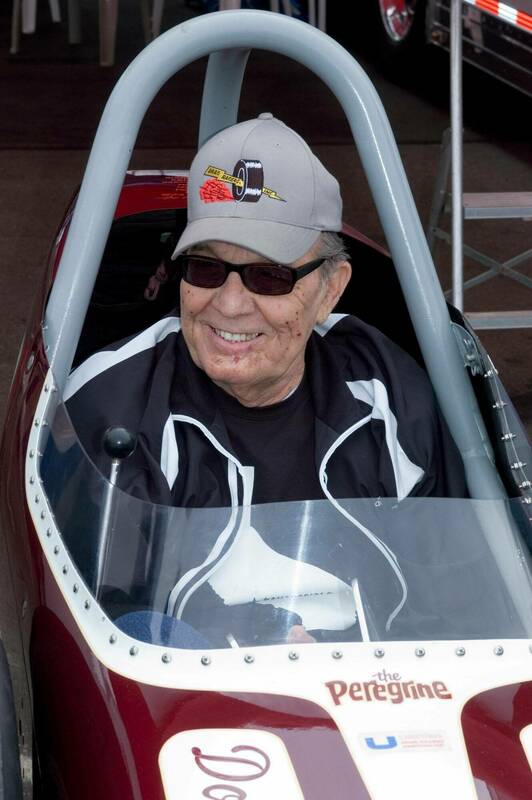 Ed had raced a Dragster prior to this car. 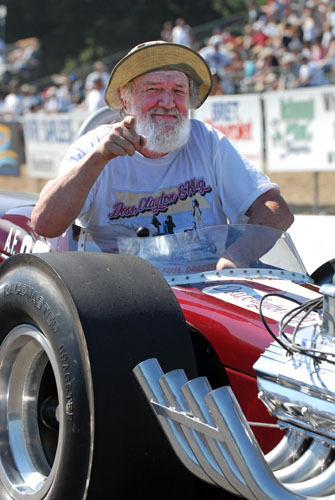 Dave McKinzie was his driver. From the days where a couple of friends could decide over a couple of beers at the local hang out, to pool their parts and go racin. Ed raced this car for only a few months. 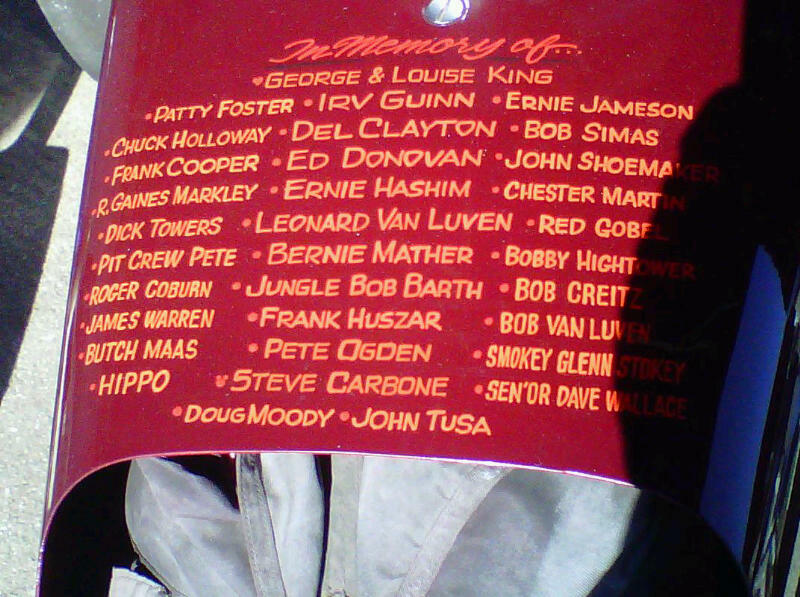 While Dave McKinzie was the driver, my old friend Steve Carbone rip was the designated helper, or in those days helpers were called Gofers, go for this and go for that!!!
. Steve told me at the Reunion in 2005 that he made many trips from LA to Lompoc. He would haul parts from Reath, Donovan or who ever had the part they needed. had Donovan axles. Most of the Chassis builders of that day used Donovan housings exclusively. Ed would sell the housing without the Olds ends, then when the rear end was mounted in the chassis, they would return the housing to Donovan's to have the ends welded on true and square. A 4:10 gear ratio was used. No transmission or in and out box were used. 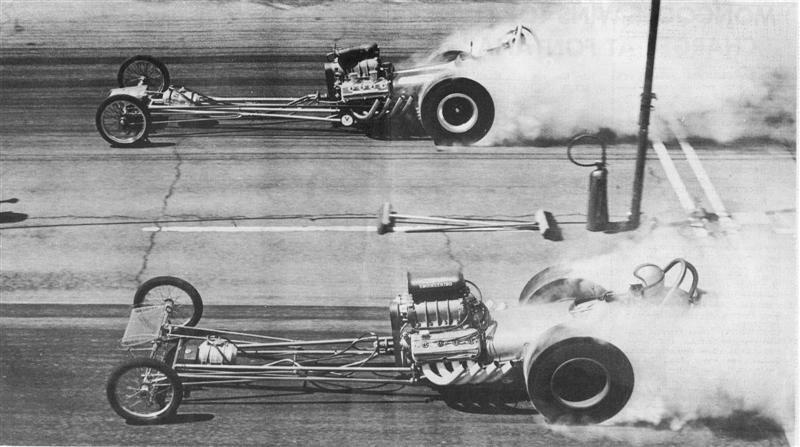 As most of the Dragsters of that era were direct drive. The steering box is Ross from a Franklin Automobile. 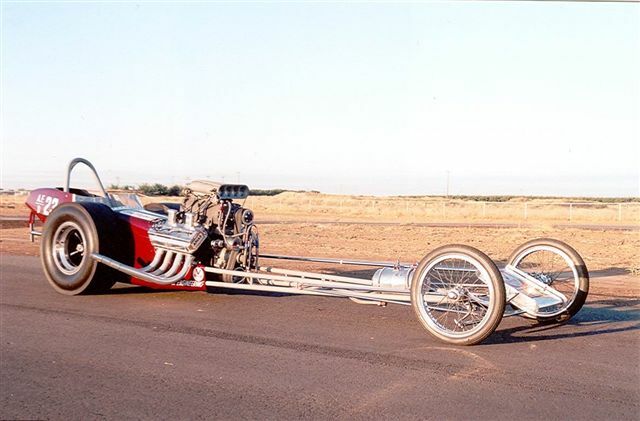 The front end was built by Dragster Chassis Guru Kent Fuller, a set of 32 Ford spindles and a Volkswagen leaf torsion bar were also used. The front Boranni wheels were also done by Fuller. Dan Daniels from Bakersfield restored the original wheels with polished stainless spokes WOW. The brakes are stock 1953 Oldsmobile. The ones we used were highly modified for high speed usage. The original Parachute was and still is a Carter Crossform. The original pack is still used. The chassis was originally 120" wheelbase. 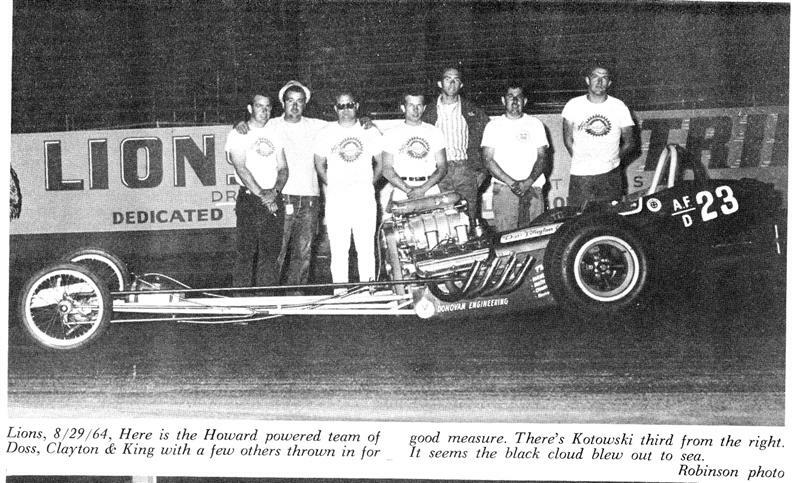 After I stood the car on its tail a couple of times we had Frank Huszar of Race Car Specialties (Dave Jeffers did the welding) lengthen it to the present length of 140" . There is a story of the wheelstand on the Duct Tape History site. 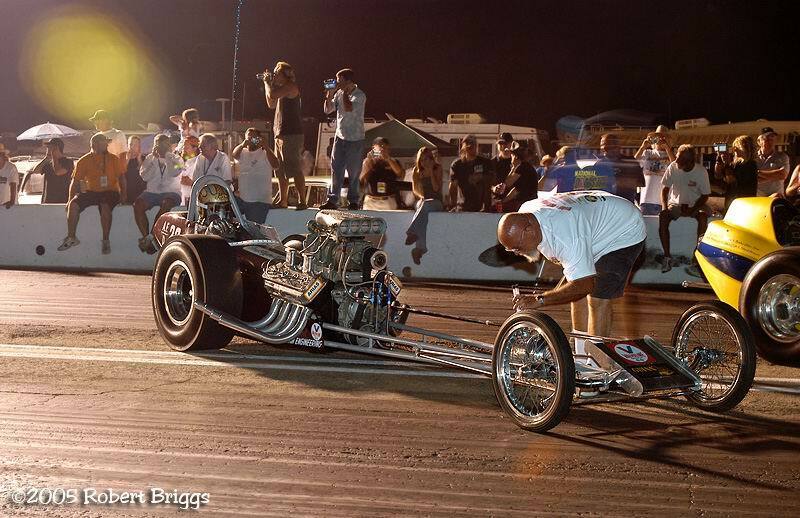 I did a gigantic wheelstand at Lions one night, could not catch the car before it crashed to the strip, bending the frame rails on both side. We simply got a bumper jack and bent the frame back as close to the originally height, the cut 2 short pieces of a wooden 2 X 4 and Silver ( aka 200 MPH tape) taped them in place on both sides of the frame. 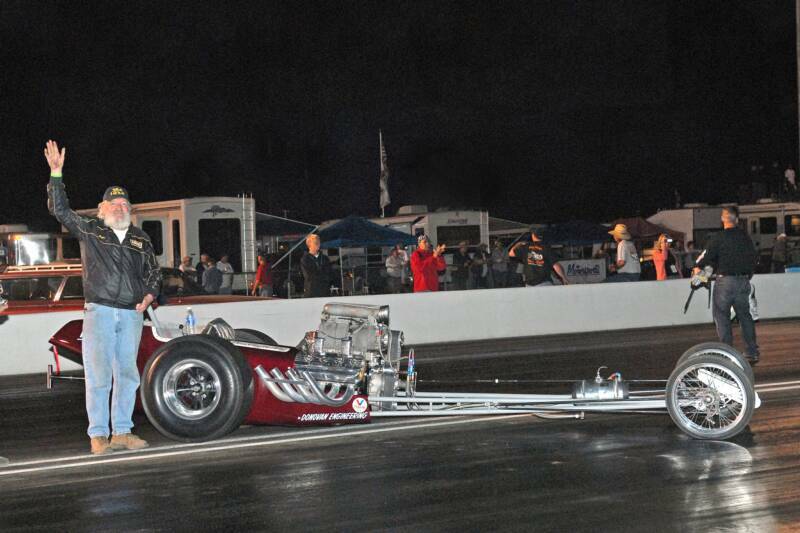 Then we went on to win Top Fuel Eliminator!!! 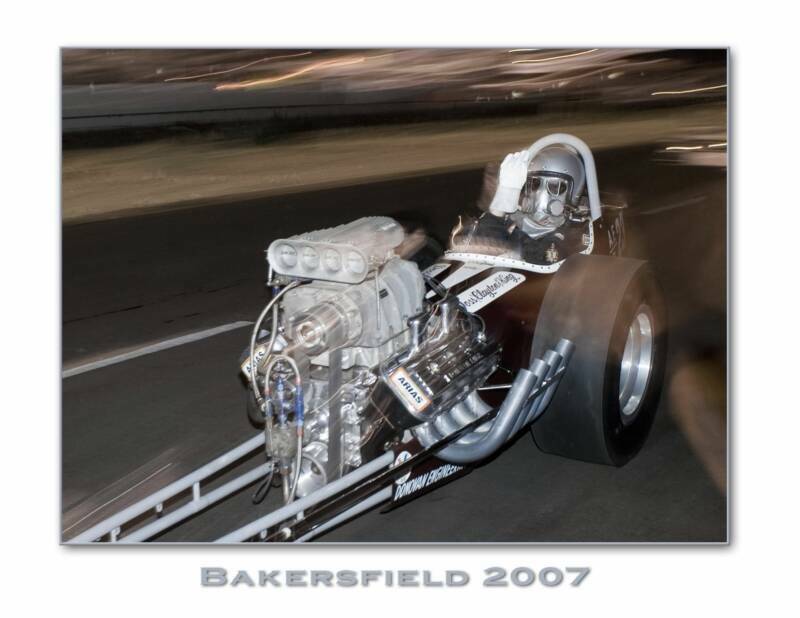 The Dragster was campaigned up and down the West Coast. At one time the car held track records for Speed or E.T. or both at most of the tracks it raced on. In 1964 the car ran and E.T. of 7:56 seconds. 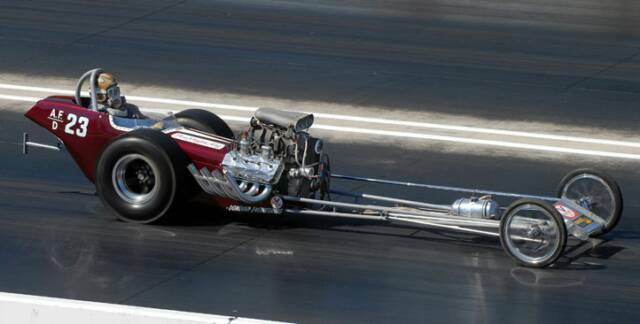 That was the new words record for A Fuel Dragster on the Drag News 1320 list. A Fuel was under - - Cubic inches on Fuel. 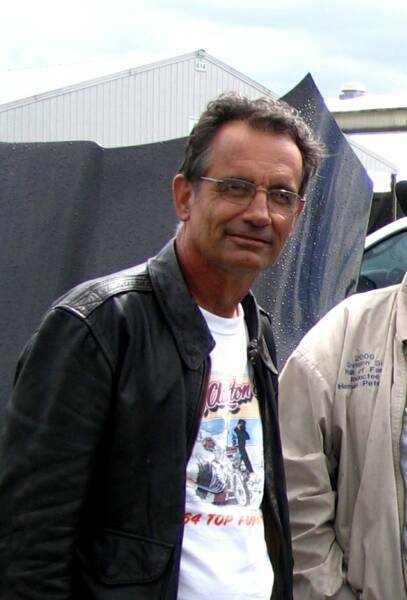 This time was turned at Deer Park Drag Strip (an old B26 Air strip) near Spokane Washington. The engine was and still is a 1956 Chrysler New Yorker, with 1955 354 cylinder heads. The heads have been reworked polished with stainless valves. The camshaft is a flat tappet. Timing of the cam is 04 degrees ahead of TDC. 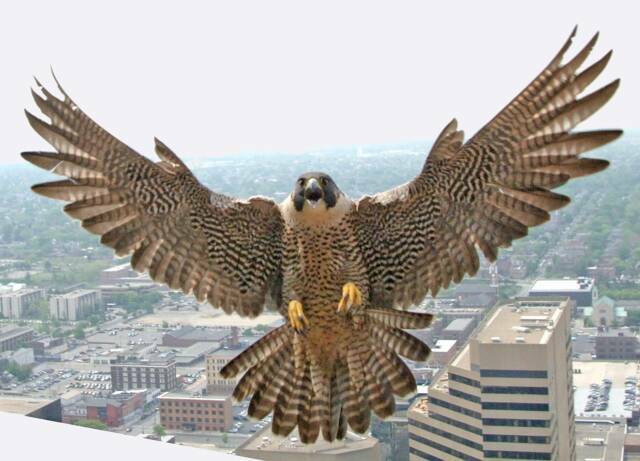 The cool looking Tee shirts that you see in the above photos show are available from Peregrine Racing. Child Sizes from age 3 up large child $10.00 ea. 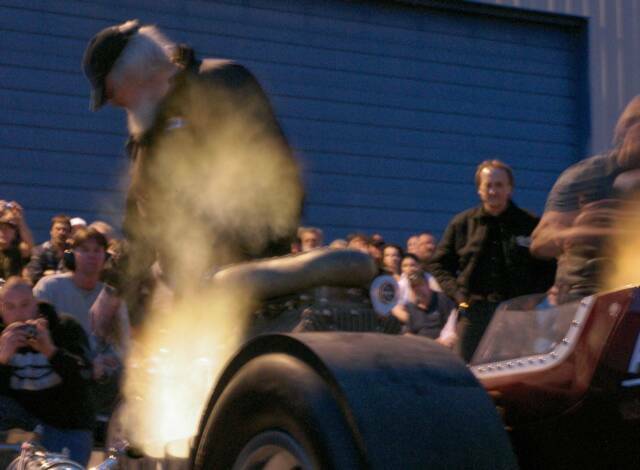 2007 March Meet, Charlie Doss sits in the seat, and feels the Nitro after 42 years. 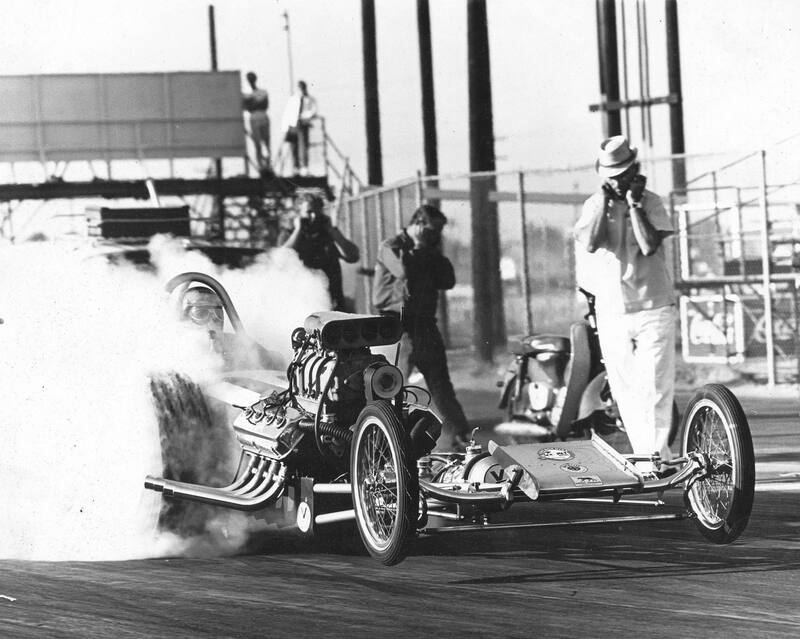 Lions Drag Strip 1963 Crew member Doug Bentz and Tuner Charlie Doss plugging his ears. CJ Hart on his scooter, Roger Coburn on the over pass. Long time friend and crew member Ken Noblett aka JAKE checks the fuel level. 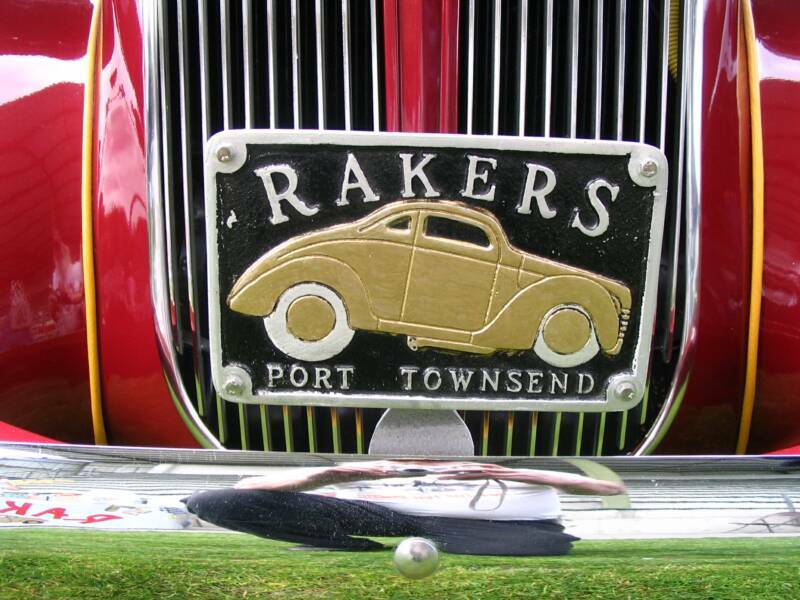 Jake has crewed on just about every car I drove from the late 60s on..
WILL NOT BE AT ABBOTTSFORD UNTILL A NEW PROMOTER IS FOUND. AFTER THE SEMI FINAL LIN SEATTLEE Carson Classic Hot nods. civic Rapay Kent WA. Lots of warmup's and Juaush Down the track on Sunday. vern Tacoma 4:30 PM til?? A really fun filled (affordable) weekend with the Vintage Racers from the days gone. 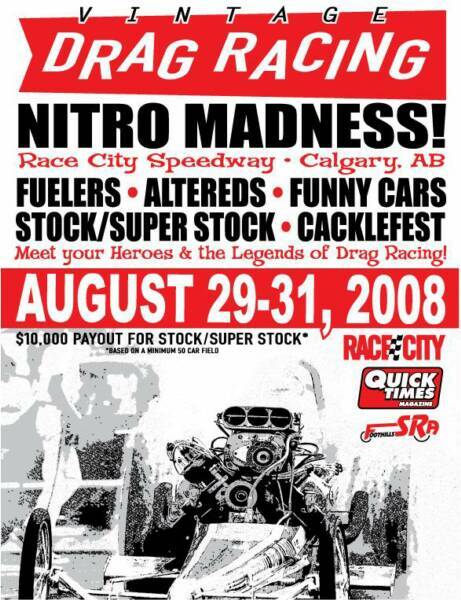 Come meet and have dinner and enjoy a Push Down warm up of the old Front Motor Dragsters, Funny Cars, This sights and Smell of NITRO wil be in the air. 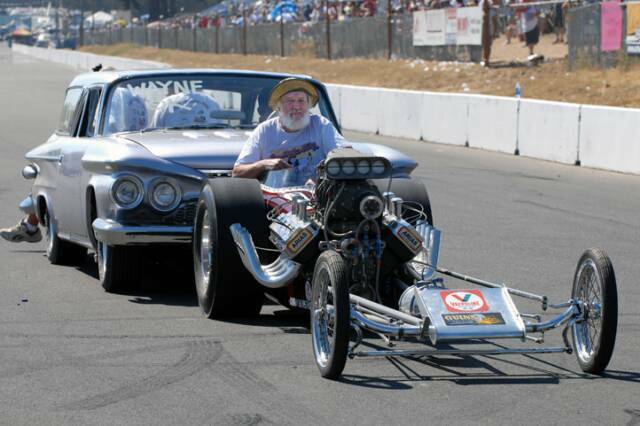 THE 28th Annual California Hot Rod Reunion. 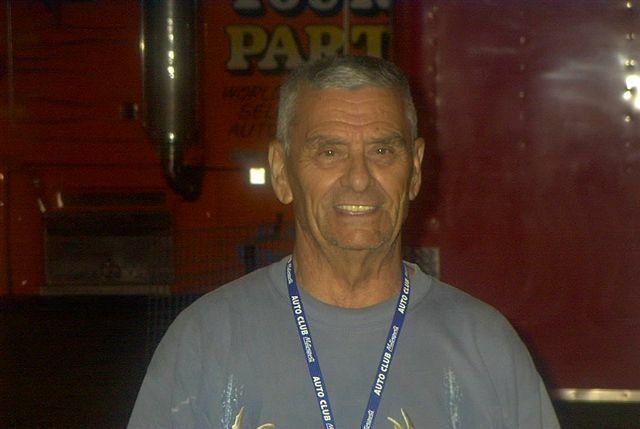 Ernie Jameson longtime friend and crewman. Please keep Ernie a nd his family in your Prayers. Ernie has helped on the restoration. Ernie donated a BRAND NEW VERTEX MAG. 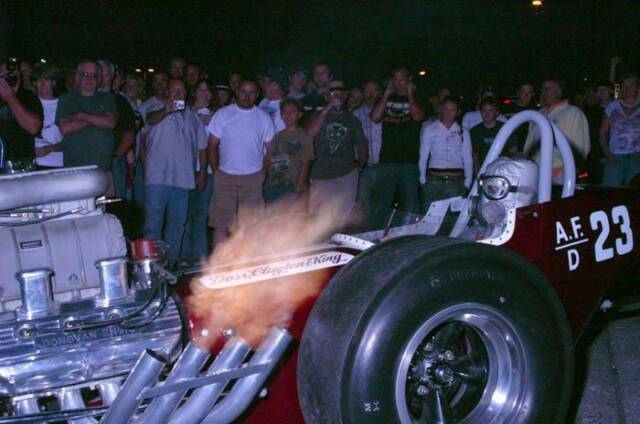 We have done over 300 fire ups with the Dragster. This one by far is the funniest yet. We were at the 2011 BC Classic Custom Car Show in Abbotsford BC. Held every year the last weekend of April. Great Show and Great People to work with. Hope to see you next year !!! The guy in the Gatornational Championship coat is Dave Jeffers. 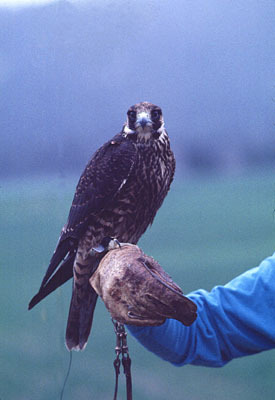 A friend since the 1960s in Southern California. 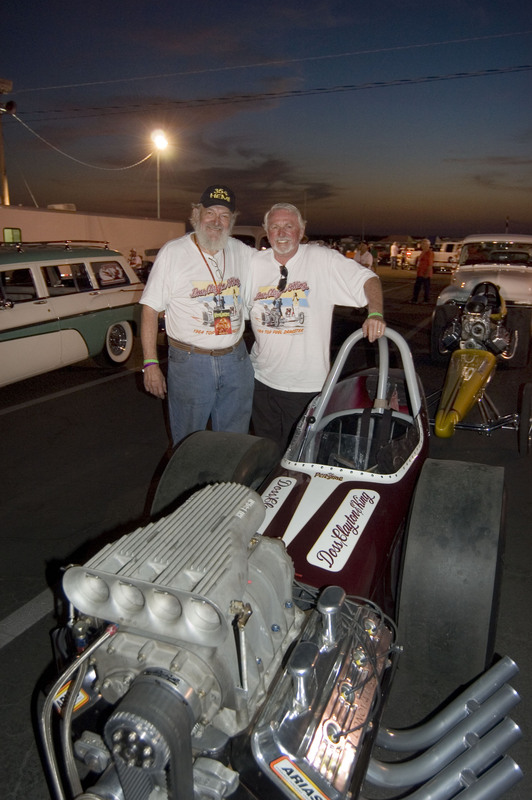 In October Wayne was an Honoree at the NHRA California Hot Rod Reunion. 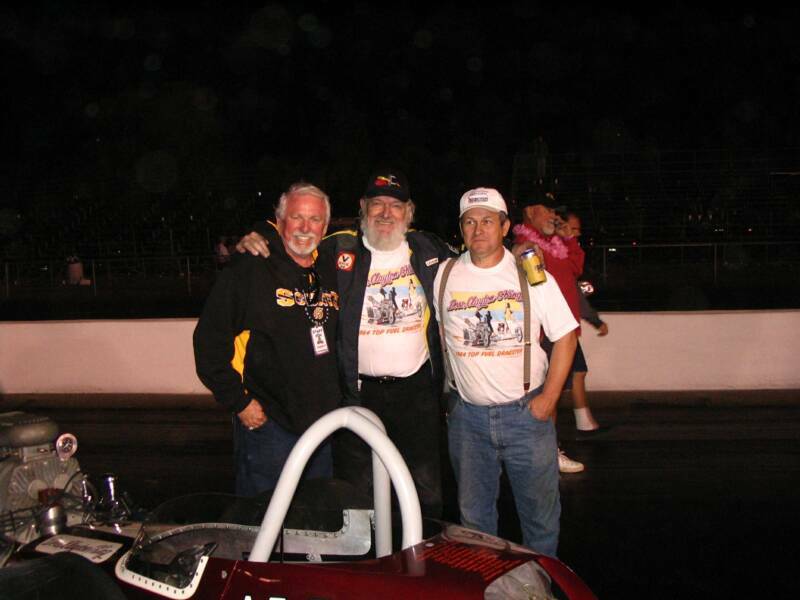 Along with felloe Racers and good friends, Harry Hibbler, John Peters, Dwight Salesnerry, and George Santos rip, George passed away a few days before his induction..Grand Marshall was Steve Gibbs. The ceremony held at the Double Tree Hotel in Bakersfield. I was so fortunate to have three tables. At my tables were , My Wife Peggy, Daughters Renee and Denise, my Granddaughter Michelle. Friends, Gary and Timmy Guinn, Dave Jeffers, Danny Brussard, Rick Stewart, Dan Lee, Big Jon Johnson, Jim Hume, Mickey Griffith, Fast Jack Beckman, Bent Cannon, Ed Iskenderian, Fun was had by all. 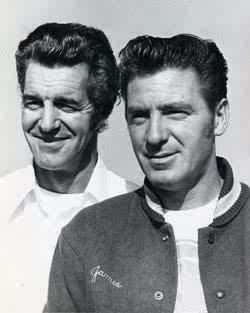 Roger Coburn and James Warren. I do MISS them BOTH. 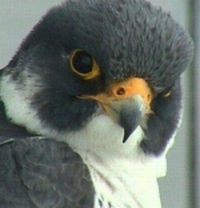 Photo by Canadas own Racer Tom..